You could be one of these people. Say om! D.C. Yoga Week got off to a stretchy start with a day of yoga Sunday on the National Mall. Didn't make it out? That's OK -- the week of special events runs through next Saturday, May 21, offering some free classes and others for only $5. Try out different yoga studios and types of yoga at studios including Bikram Yoga, Stroga and Tranquil Space. See participating studios and the complete schedule here. 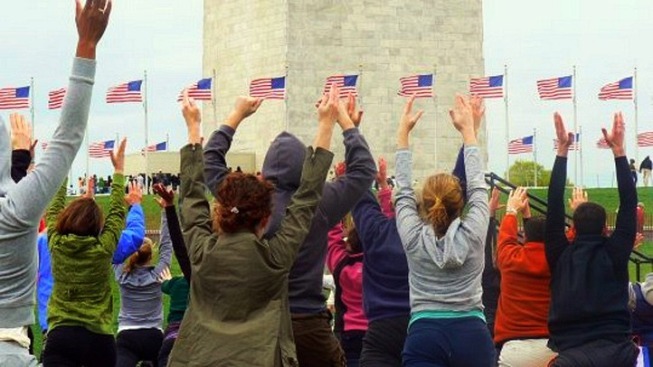 The week will wrap up with a Sun Salutation Flash Mob on Saturday, May 21 from 10 to 11 a.m. at John Marshall Park (Pennsylvania Avenue and 4th Street N.W. ).